While most British people make comments about the rare sunny days as a form of greeting, everyone we met in Japan said, “I hope it’s clear when you go to Mt. Fuji”. 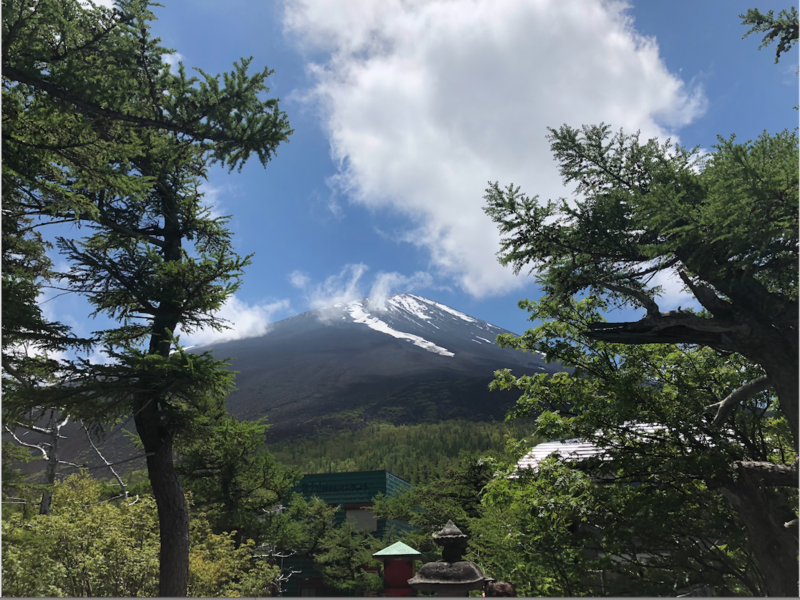 In the days leading up to our Lake Yamanaka retreat, locals and students alike would check the weather forecasts in hopes we would avoid the clouds and enjoy a rare sunny day on Japan’s tallest mountain. 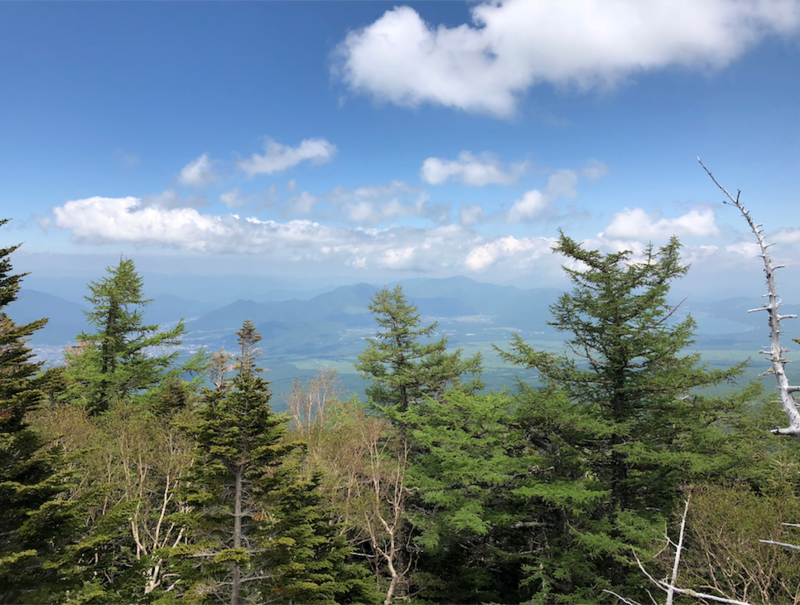 The forecasts were promising, but hopes were not too high, as Professor Katada said she only experienced a cloud-free day at Mt. Fuji once during her time leading this maymester. It seems that we were indeed extremely lucky. Not only did we avoid the clouds, but the sky was so clear we could see all the way to Lake Yamanaka. Some people said they could even see the giant swan boat that was docked near where we stayed. Professor Katada’s photo of Mt. 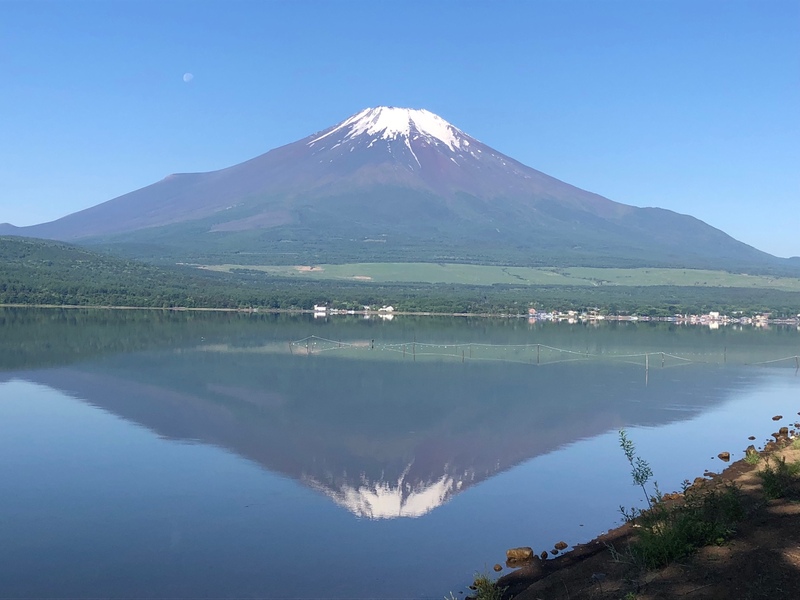 Fuji being reflected on Yamanaka Lake. As we started the ride up the mountain, we were graced with lush green trees and unrivaled views of Japan’ landscape. While we did not climb any part of Mt. Fuji, our bus was able to drive up to the fifth stop, a bustling tourist area filled with souvenir shops, food, horses, and look-out spots. We had an hour and forty minutes to explore this part of Mt. Fuji however we desired. Some students immediately rushed to the restaurants while many more started exploring the overwhelming amount of souvenir places, looking for gifts for friends and families. One of the many views on Mt. Fuji. Lake Yamanka can be vaguely seen in the distance. In the alley between two large shops was a red tori gate, signaling the way towards a Shinto Shrine located at this part of the mountain. People got their fortunes told and others appreciated the beautiful architecture of the shrine. Next to the shrine was a small look-out, with a crystal-clear view of Lake Yamanaka. While this shrine and view was stunning, it was crowded and not as serene as some of the other Shinto Shrines in Japan. However, located at the top of Mt. Fuji, is supposedly a breathtaking shrine, overlooking all of Japan. The trip up might be strenuous, but I’m sure that makes up for it. Maybe one day I’ll be able to see that view for myself. View of the peak of Mt. Fuji from the 5th stop on the mountain. After our time was up, we all meandered our way back to the bus, some with ice cream cones in hands, others with arms full of souvenirs. As we started driving down Mt. Fuji, the sky became dark as mist rolled in. It looked as if we were actually driving through the clouds. It seemed as though Mt. Fuji held off the cloudy weather until we were done enjoying our time. Supposedly we got stuck in traffic, but I’m sure no one even noticed, as everyone was pknocked out the entire bus ride back. That night, some of us, sadly me as well, were suffering from altitude-related headaches, but it was all worth it. Not many can say they were able to see across Japan on Mt. Fuji. We were graced with perfect weather and will have memories of the beautiful views and clear air for a long time to come. This entry was posted in Yamanaka Lake by geajapan. Bookmark the permalink.